Programs for many spring events will be available on the SOMD website. Tickets are available in advance from the Hult Center (541-682-5000) or the UO Ticket Office (541-346-4363). 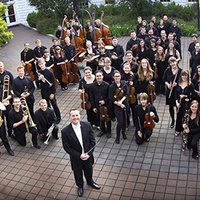 The University Symphony Orchestra (David M. Jacobs, conductor) will perform two works with the University Singers (under the direction of Christopher Olin). The centerpiece repertoire for that collaboration will be Ravel's Daphnis et Chloe Suite #2. The Oregon Wind Ensemble (Rodney Dorsey, conductor) will perform repertoire including Joaquin Turina's "La Procesion del Rocio," Morten Lauridsen's "O Magnum Mysterium," Fisher Tull's "Concerto Grosso" (featuring the Oregon Brass Quintet), and two tangos, one each by Andrea Reinkemeyer and John Mackey.